Ultrotherm adhesive. Used for bonding Ultrotherm tiles and Ultrotherm reveal tiles. Supplied in a 15kg tub (covers up to 10m 2 or 20 Ultrotherm tiles). To download a technical data sheet with more information, click here. Ultrotherm adhesive. Used for bonding Ultrotherm tiles and Ultrotherm reveal tiles. Supplied in a 10kg tub (covers up to 10m 2 or 20 Ultrotherm tiles). Ultrotherm has a ‘Class 0’ fire rating in accordance with Building Regulation Approved Document B.
BS 853 Smoke density (3 metre cube test). Below is a video guide on how to install ultrotherm tiles. Below is a video of how to plaster over the endotherm tiles once installed. Below is a video showing you how to reinstate everything you took out of your room. repare wall surfaces by removing wallpaper or flaky paint. PVA adhesive can be used if necessary to stabilise the surface of the wall. Ultrotherm® can be installed with or without removing skirting boards and coving. Radiators should be lifted from their brackets but the brackets themselves do not need to be removed. 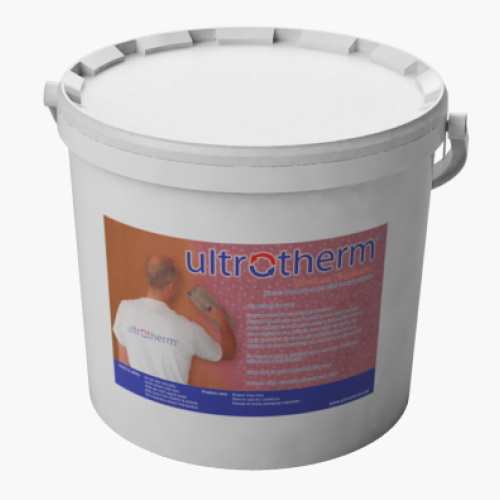 Apply Ultrotherm® adhesive to the wall surface directly from the container using a 6mm notched trowel. Once sufficient adhesive has been applied, an Ultrotherm® tile is pressed firmly on to the wall. Apply further adhesive and tiles until the wall is completely insulated. Ultrotherm® tiles should be cut around radiator brackets. These can be covered with removable strips of Ultrotherm® once the wall has been plastered. Ultrotherm® is easily cut using decorator’s scissors. A 15mm plastic trim bead is bonded to the plaster above the skirting board and beneath the coving using Ultrotherm® detail adhesive. The insulation tiles are then located tightly into the trim bead and pressed firmly into the wall adhesive. Ultrotherm® insulation beads are installed with the insulation strip in contact with the window or door frame using Ultrotherm® detail adhesive. Ultrotherm® adhesive is applied to the window or door reveal using a 6mm notched trowel. Ultotherm® reveal tiles should be cut to the required size, located tightly into the insulated trim beads and pressed firmly into the wall adhesive. The joints between the Ultrotherm® tiles must be covered with fibre mesh tape. Ultrotherm® angle beads are used to form external angles. 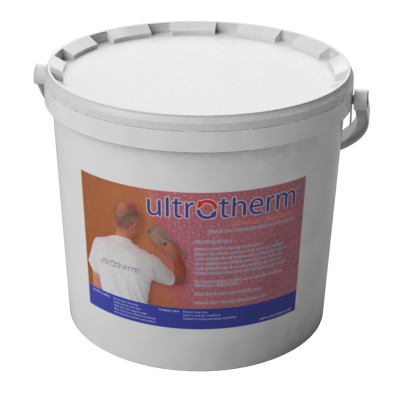 In most cases Ultrotherm® is plastered using Thistle Board finish or Multi-finish. The first step is to apply a base coat of plaster that fills-in the circular holes behind the mesh covering. The plaster should be mixed to a thicker consistency than normal for this coat. It is also possible to build-up layers of plaster in a more traditional style. Applying a coat of ‘Hardwall’ plaster before the skim coat increases impact resistance. Once the filling coat has started to set, two further coats of plaster skim are applied to the wall. reinstated. Care should be taken not to over-compress Ultrotherm® when securing skirting boards or other items back to the wall. Before re-hanging radiators, Ultrotherm® should be placed over the brackets to prevent cold spots. This also allows the radiator brackets to be easily removed if necessary. Walls can be decorated after approximately two weeks or once the plaster has fully dried. To download a pdf guide of the above step-by-step installation instructions, click here. Reduces energy bills as you need to pump less heat into the room. Can reduce heat loss through by up to 40%. No need to alter the aesthetics of you room.